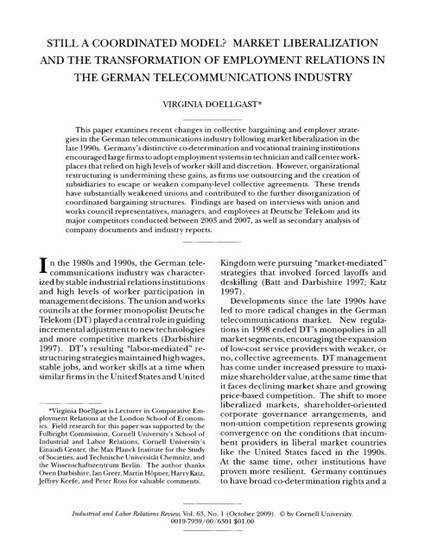 This paper examines recent changes in collective bargaining and employer strategies in the German telecommunications industry following market liberalization in the late 1990s. Germany’s distinctive co-determination and vocational training institutions encouraged large firms to adopt employment systems in technician and call center workplaces that relied on high levels of worker skill and discretion. However, organizational restructuring is undermining these gains, as firms use outsourcing and the creation of subsidiaries to escape or weaken company-level collective agreements. These trends have substantially weakened unions and contributed to the further disorganization of coordinated bargaining structures. Findings are based on interviews with union and works council representatives, managers, and employees at Deutsche Telekom and its major competitors conducted between 2003 and 2007, as well as secondary analysis of company documents and industry reports. Doellgast, V. (2009). Still a coordinated model? Market liberalization and the transformation of employment relations in the German telecommunications industry [Electronic version]. Industrial and Labor Relations Review, 63(1), 3-23.